This is just beautiful! You are so talented! Wow I could just go on and on about all the details! Love everything from the tablecloth to the dishes! The roses you made are impressive and who would think to check out the pharmacy for something like that table runner! 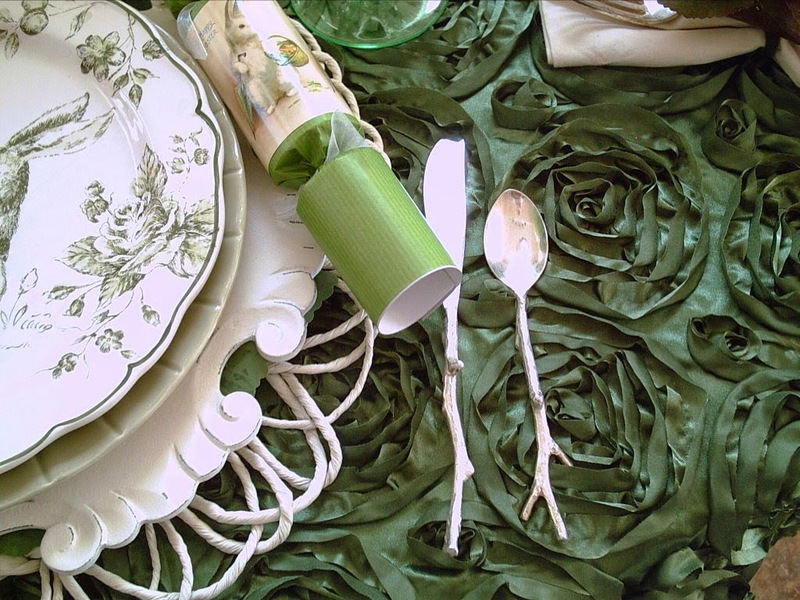 Of course I love the toile dishes and the glitter egg you put together! You put a lot of thought into this and I like it all. I love love love this Valerie! 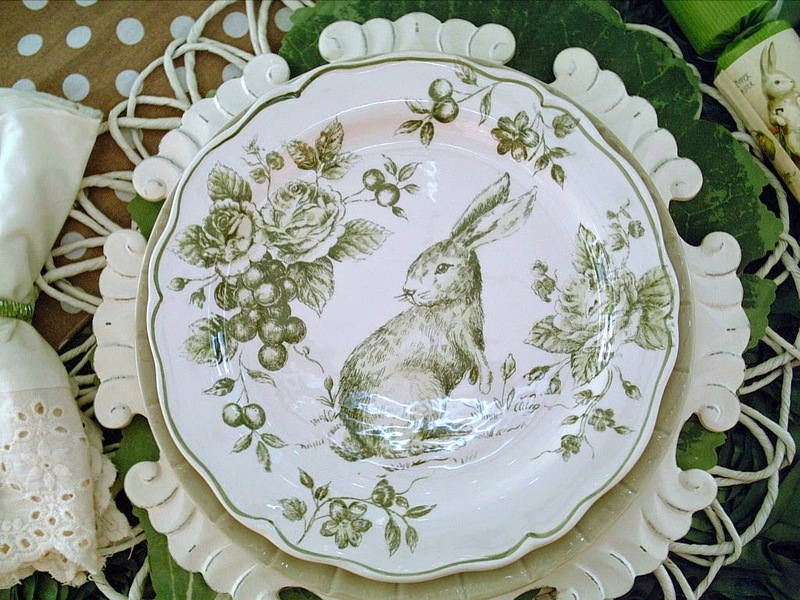 Your neutral palette is so pretty and perfect for your beautiful bunny plates! Love the polka dots too~ it's perfect! There is nothing not to like on your table. 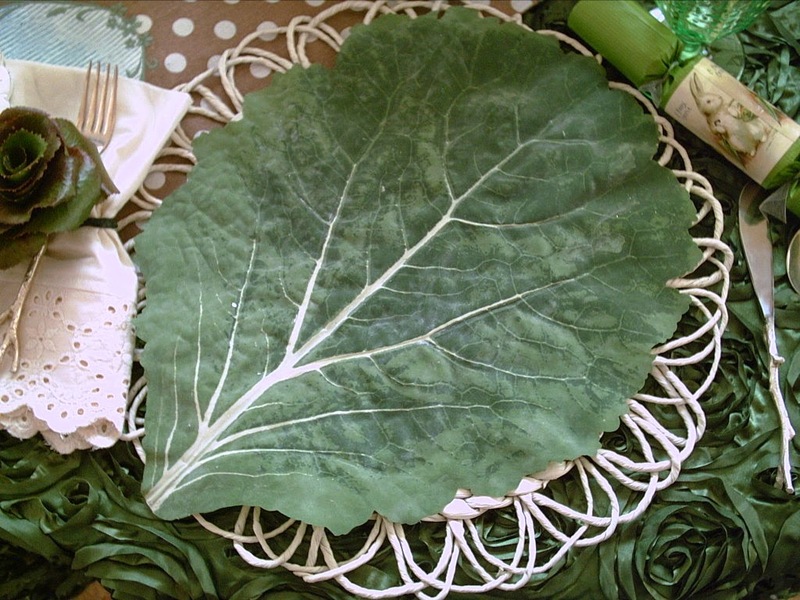 Every element is a perfect complement and you are so right about greens. They not only mix well together but with other colors as well. 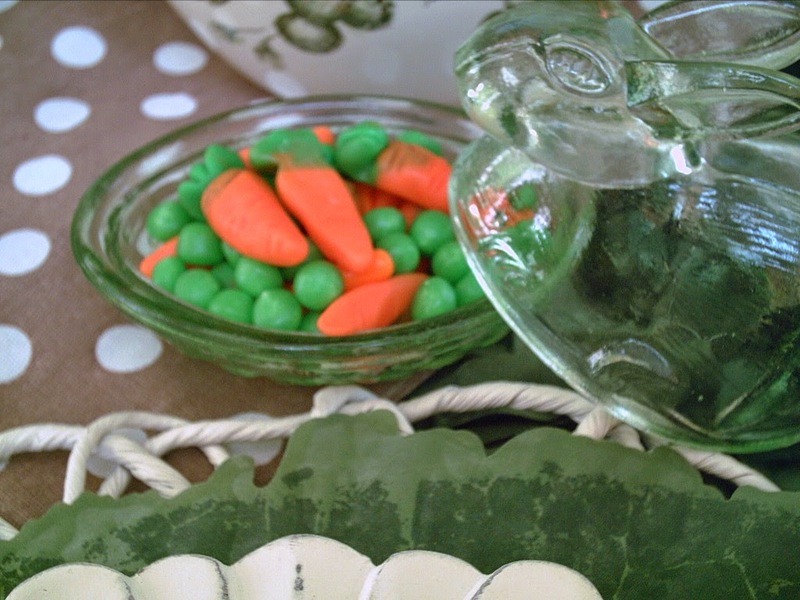 Such a beautiful Easter tablescape. 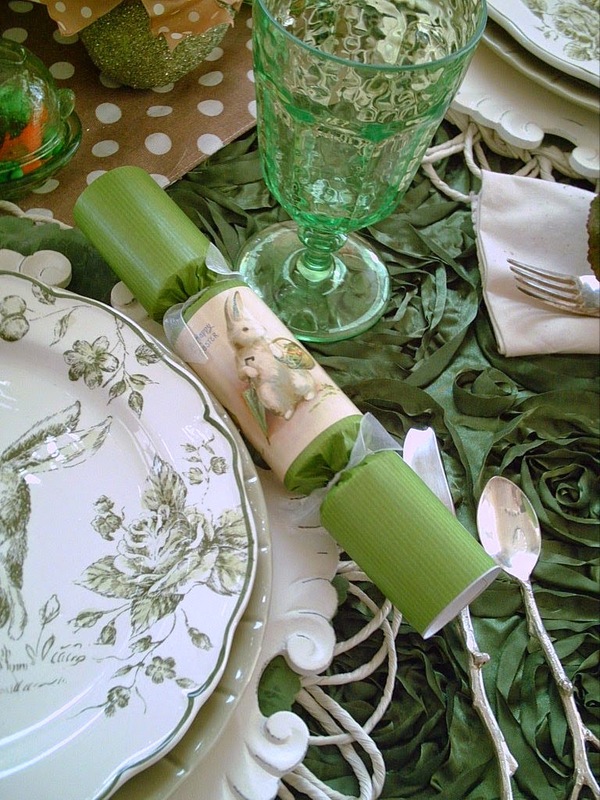 I love all the china with the bunnies and the bunny crackers too. Lovely table!!! Such sweet soft colors! I love that you found your runner at the pharmacy! 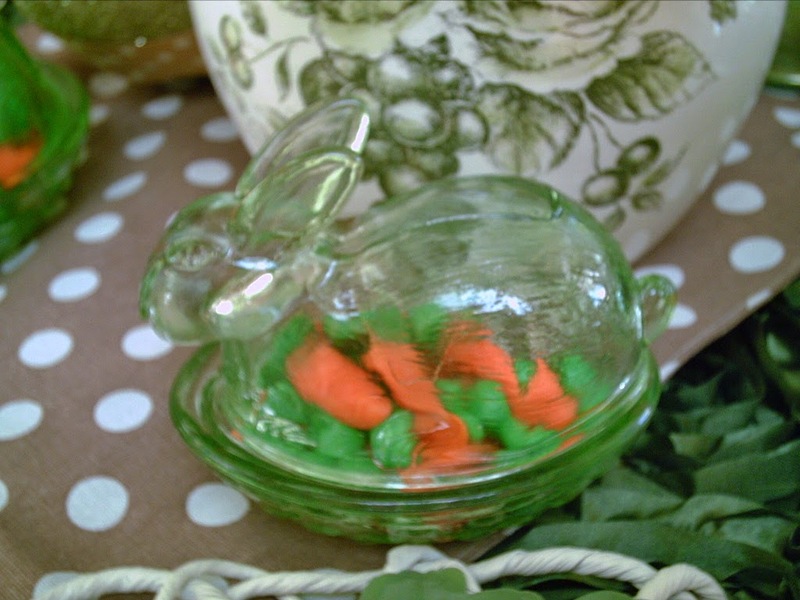 I found cute little bunnies last year at a pharmacy and included them in my table. Those plates are gorge, and the leaves so clever! Valerie, Beautiful! I love every element of this table. 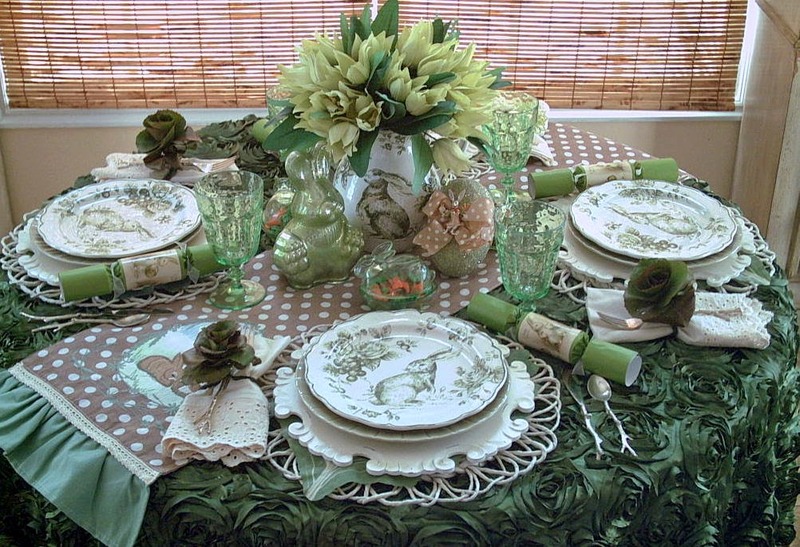 The green ribbon roses on the tablecloth look like a field of ruffly lettuce heads for your charming toile rabbits to feast upon. 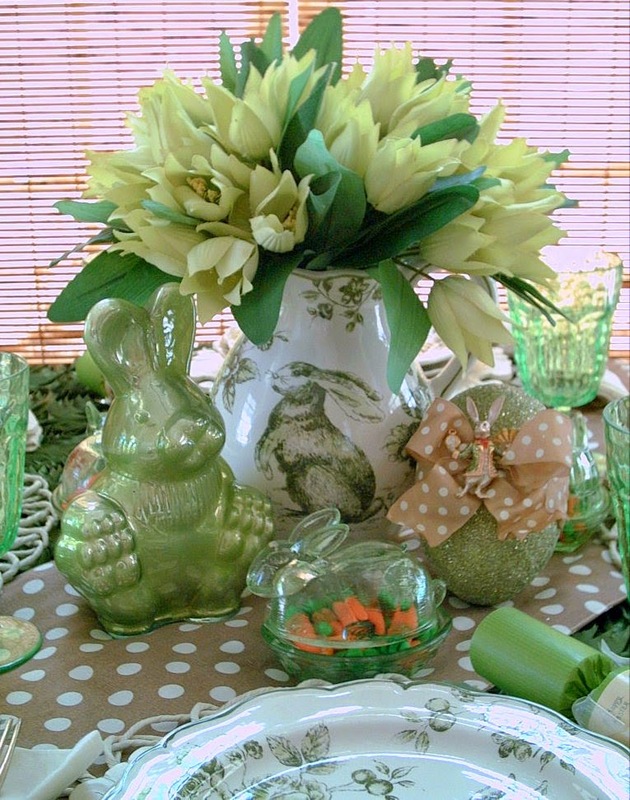 The pale green tulips are not only lovely in the green bunny pitcher but lend themselves to being the element that guides your eyes across the table by gracefully bowing to the pretty green stemware and on to the stack of plates topped with the toile bunnies. Artfully done dear lady. 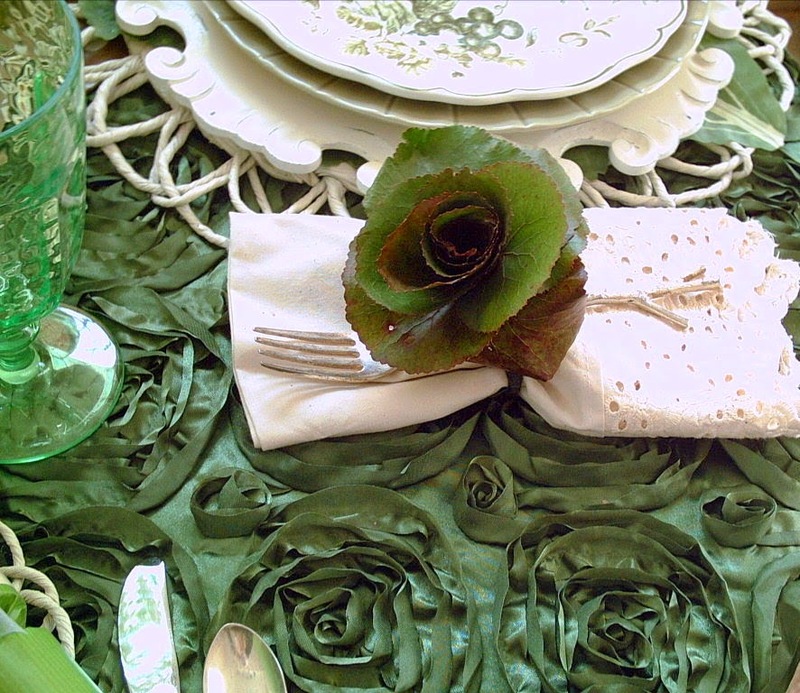 Love your green rose napkin rings crafted from galax leaves too. Have a very happy and blessed Easter. 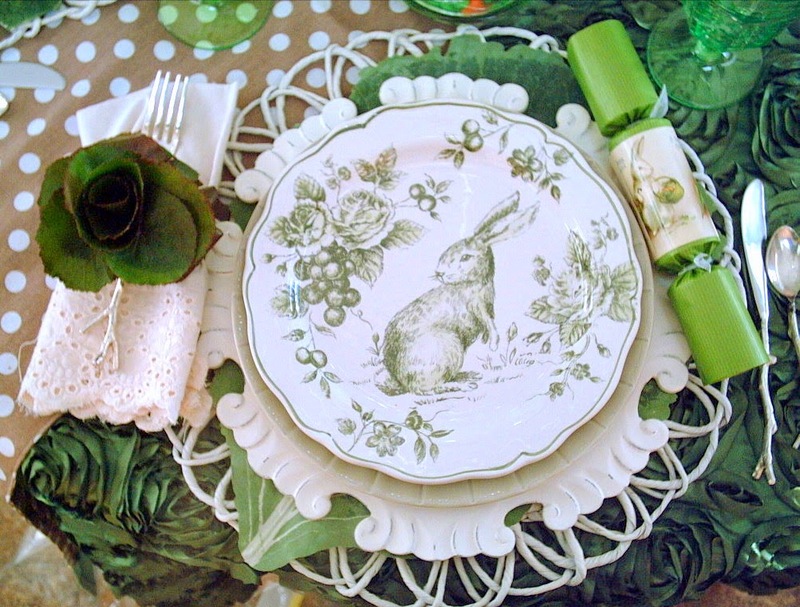 Valerie, I am not sure how I missed this table...it is my favorite of any you have done...those bunny plates are fabulous. I need to find some on eBay for next Easter! Beautiful tablecloth, too. The flatware is perfect with this setting. Thanks for sharing this gorgeous table! You made roses from leaves how creative is that! Once again you have designed a gorgeous table and thanks for sharing it at Celebrate Your Story link party. Have a great week and I hope you join us again. What a lovely table! Toile is one of my favorite design choices and it's so perfect for Spring. Thank you for sharing at the Celebrate Your Story Link Up Party. 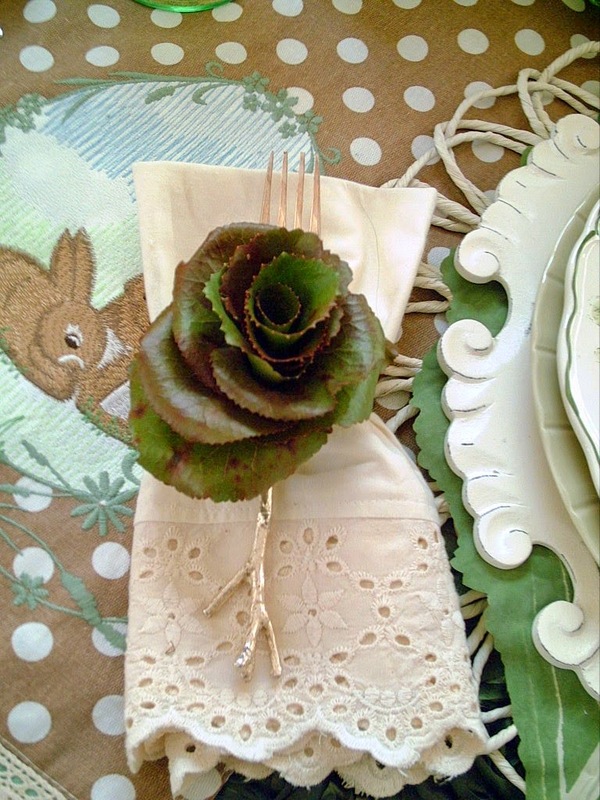 Love this place setting! 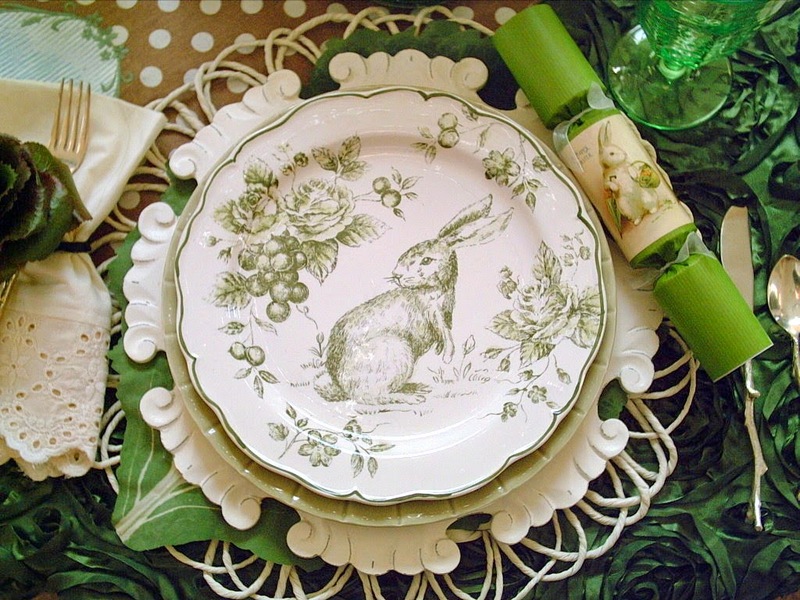 Toile is so perfect for Easter! Ooh I love each detail you put together here! I have that dish pattern except the dishes are a different shape. 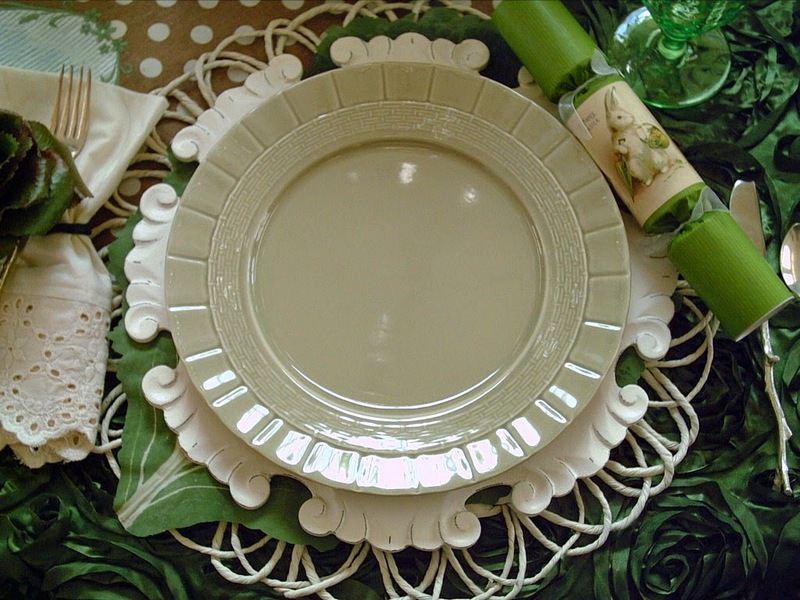 The polka dot runner is the cutest and I love the napkins rings you created. 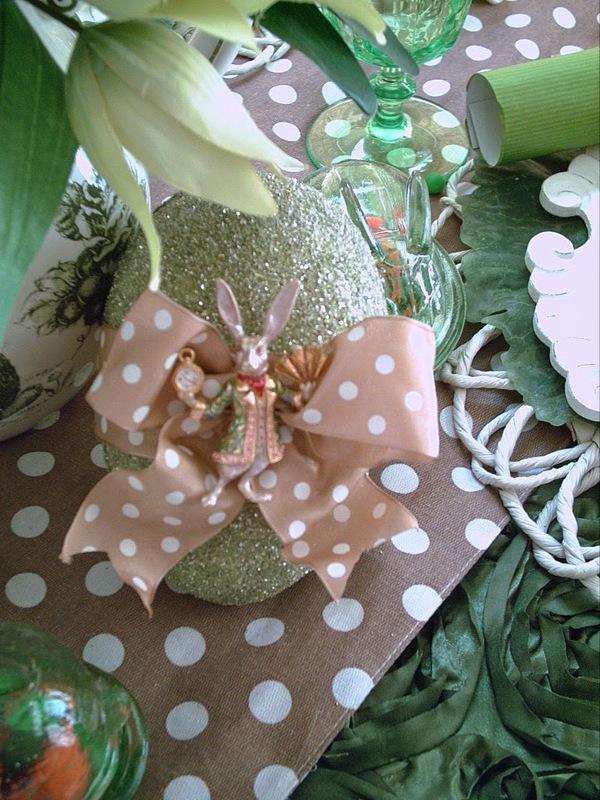 Best wishes for a Happy Easter! 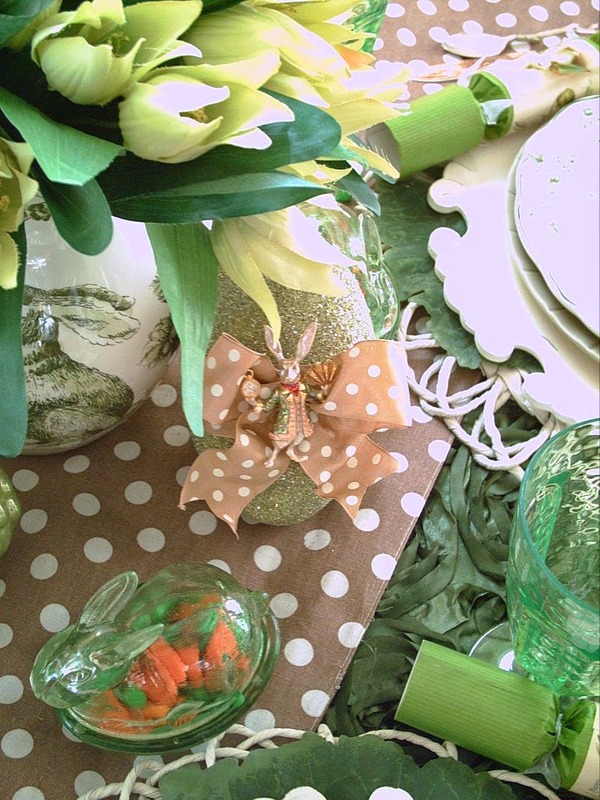 This is a beautiful Easter table. 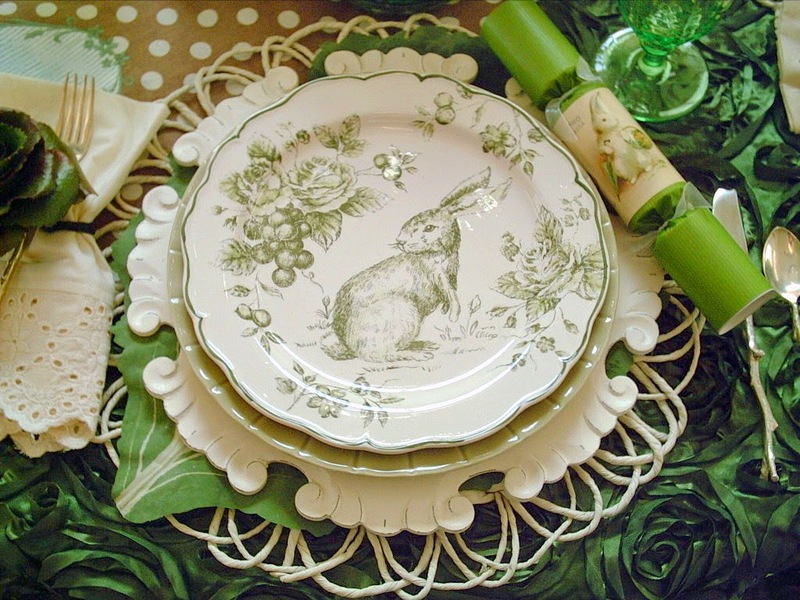 I love the green ribbon rose tablecloth and the green toile bunny plates. Gold Star for you Valerie this is gorgeous! 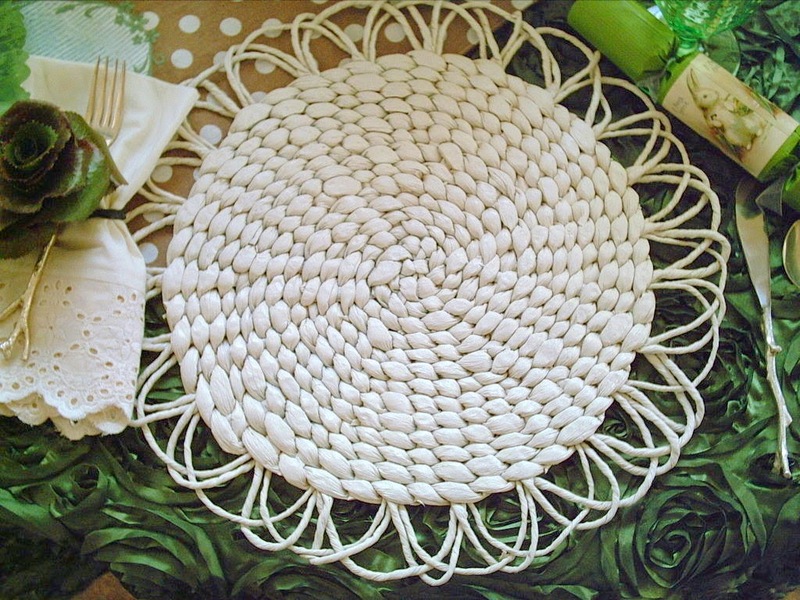 I am head over heels in love with the rosette tablecloth. 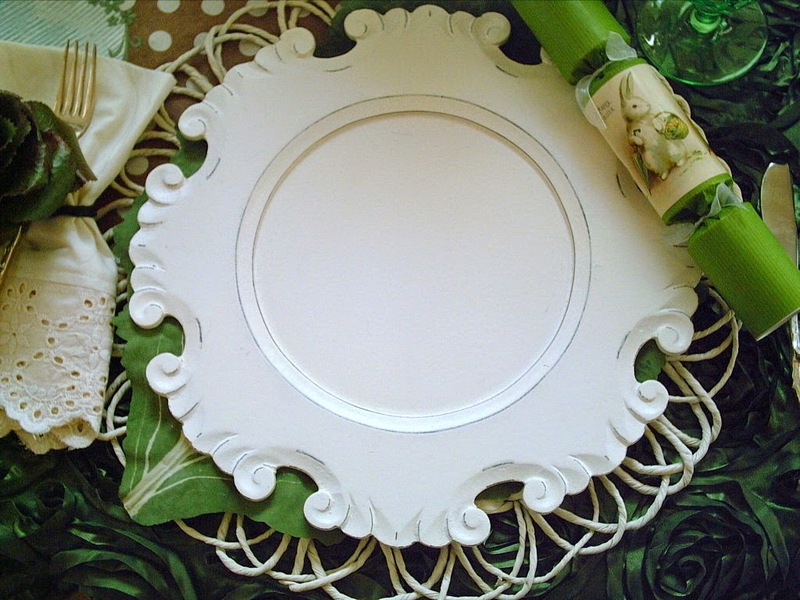 It is the perfect foundation for you beautiful dinnerware and accessories. Thank you for sharing with us this week at Celebrate Your Story, have a great week and have a Happy Holiday. As I read your post, I kept liking each new element better! I love all of it, the flatware, those Pier One chargers I have lusted after for years, the giant leaf, and those roses you made!!! Oh, and let's not forget the tablecloth! You have blown me away with this beautiful table! Thanks so much for sharing at Celebrate Your Story!